This theory places Middle Earth in northwest Africa (present day Morocco and the Atlas Mountains) in pre-Phoenician times. I need an Ice Age Spain to get it to work, and I think Phoenicia missed the Ice Age. Using GoogleEarth, I studied Morocco and was able to trace a route from the northeast to southwest that closely follows the storyline of Tolkien's books. Here are the important locations. Rivendell is located somewhere in Tazekka National Park (most likely near the lake named Barrage Bab Louta). The Shire is about 100km to the northwest. Look at the area between the town of Taounate and the river just south of that town. You can even see the Buckland bulge on the opposite bank of the bend in the river. A straight route from Rivendell through the Shire points to the Gray Havens at the Straight of Gibraltar. This puts Numenor in the Azores (or possibly further south). Moria is located quite a distance south in Toubkal National Park. Enter from the lake named Barrage Ouirgane, then journey through the mines 15-20 miles to the exit at the lake named Lac d'ifni. This places the bridge of khazadum somewhere under Jebl Toubkal (elevation 4167 meters) in the High Atlas Mountains. Following the water downhill from Lac d'ifni you pass through Lorien on your way to the falls where the breaking of the fellowship takes place. The falls (now a dam) are at the western end of the lake named Barrage Aoulouz. Frodo and Sam head south beneath the river toward Mordor which is in the Anti-Atlas range centered on the modern town of Tafraout. The others head west above the river through Rohan, past Isengard (location uncertain), and eventually reach Minas Tirith located near the modern town of Agadir. I found a great hill to place Minas Tirith, but it is much closer to the sea than Tolkien shows on his maps. The battle plain in front of Minas Tirith extends from Agadir to the river and the modern towns of Inzegane and Ait Melloul on each side of that river. If you look at the Anti-Atlas mountains around Tafrout, its not hard to imagine Frodo and Sam continuing on past the black gate and finding another route into Mordor. To get this theory to work, I had to sacrifice the full length of the Anduin River. The Anduin is now fragmented into several rivers. The events of the hobbit are harder to work out, but I still managed to find a probable location for the lonely mountain and laketown in eastern Morocco. Last edited by MoroccoTheory on Mon Jun 23, 2014 6:58 pm, edited 3 times in total. The compass points on Tolkien's map are shifted in this theory. Tolkien's north is shifted to northeastern Morocco. Also, the ancient Moroccan climate would have to be different to get this theory to work. An Ice age Spain alters the climate of Morocco. Last edited by MoroccoTheory on Fri Oct 02, 2015 10:54 am, edited 3 times in total. Hi MoroccoTheory and welcome to TORC. Interesting theory and there are some quite good similarities there. I take it you are not "serious" about it on any level and don't genuinely believe so I won't poke holes in it. So, during the Third Age, the Atlas Mountains were probably at the bottom of the ocean and Agadir was probably on top of a different mountain. But they might not have been either, so the changes over the time could explain all the things wrong with your theory, like Tazekka National Park to Agadir being only about half the distance from Rivendell to Minas Tirith, and in quite a different direction. Obviously the land got squashed up. Yeah, you have to consider rivers changing course, lakes shifting or changing in depth and sedimentation. The entrance to Moria could now be underwater. The exit could be further up the glacial valley from Lac Ifni and buried under a landslide or sediment, closer to the peak of Jebel Toubkal. I think this theory is interesting. You can poke holes if you want. Do the Berber people of Morocco have Nordic roots? If you continue with this thinking, the northern parts of Beleriand could still exist in Spain and you might even place Angband in the Pyrenees Mountains. The Strait of Gibraltar would have formed many years after the War of the Ring as the Lune River valley was lost to the sea. All the land from the Gulf of Lune to the Ice Bay of Forochel is now under the Alboran Sea (eastern side of Gibraltar), but would have been mostly dry land during the War of the Ring. The remainder of Beleriand called Lindon is situated on either side of the Strait of Gibraltar. Forlindon is the Spanish side and Harlindon is the southern Moroccon side of the strait. Spain would be under the effects of an ice age during the events of the hobbit and War of the Ring. The western Mediterranean basin is the Ice Bay of Forochel (or possibly just east of the ice bay). Tolkien's Oliphants would be some relation to the Mastodon or the African Mammoth (Mammuthus africanavus). Last edited by MoroccoTheory on Wed Sep 30, 2015 3:13 pm, edited 7 times in total. scirocco wrote: Hi MoroccoTheory...like Tazekka National Park to Agadir being only about half the distance from Rivendell to Minas Tirith, and in quite a different direction. Obviously the land got squashed up. If you measure distance in paces or strides, the shorter legs of halflings and dwarves could help explain things. Having been to Gibraltar several times I fancied it as a passable Minas Tirith. Well done Morocco for an ingenious and novel concept. I saw many years ago an area, possibly in Australia, I forget, a geographical parallel to Mordor. I think finding modern day parallels to Tolkien landscapes an enjoyable pastime. The remnant islands of northern Beleriand are the Balearic Islands in this theory. The lands north of Beleriand (including most of Spain) are under a mixture of water and ice, except for Lindon and the Lune river valley. Last edited by MoroccoTheory on Fri Oct 02, 2015 10:57 am, edited 2 times in total. The Gulf of St Lawrence in North America looks like an inverse of the Gulf of Lune in Middle Earth, the St Lawrence river an inverse of the Lune river, and Hudson bay an inverse of the Ice Bay Forochel. If Gandalf left Middle Earth (Morocco in this theory) and sailed into the west, he may have ended up in North America near Baltimore where Francis Scott Key later watched fireworks over Fort McHenry. Does anyone else notice the similarity between Morocco/Spain/Balearic Islands and Middle Earth/Beleriand? The Argonath could be somewhere close to where this photo was taken just west of Barrage Moukhtar Soussi. The modern dam built nearby has altered the depth of the water. If the "Pillars of Kings" once stood here, they may have looked more like Mount Rushmore...faces carved into the cliff. This is the hill in Agadir where I place Minas Tirith. Last edited by MoroccoTheory on Fri Oct 02, 2015 6:32 am, edited 3 times in total. This rock feature near Tafraoute could a remnant landmark of Mordor in the Anti-Atlas Mountain range. Last edited by MoroccoTheory on Wed Jun 25, 2014 5:40 pm, edited 2 times in total. The foundations of Isengard could still exist near the lake called Barrage Abdelmoumen, but the modern dam has altered the water level. The flow of water may even have reversed since ancient times. Tolkien's map shows a river flowing west from Isengard to the sea. The locations for Edoras and Helms Deep are highly uncertain. Helms Deep may have been close to the modern city of Amskroud. Last edited by MoroccoTheory on Thu Jun 26, 2014 3:31 pm, edited 6 times in total. The Friouato and Chiker cave systems are not far from Tazekka National Park, the likely location of Rivendell. I could imagine the trolls from "The Hobbit" coming out of these caves and moving down from the mountains to waylay Thorin, Bilbo and the rest of the dwarves. Last edited by MoroccoTheory on Sat Jul 05, 2014 8:22 am, edited 1 time in total. Mirkwood Forest is the biggest thing missing in modern Morocco. That huge forest no longer exists and just fragments of the great river Anduin remain. Fanghorn Forest would be located on the southern slopes of the Atlas Mountains stretching from the slopes above the eastern end of Barrage Abdelmoumen quite a distance eastward, but not all the way Barrage Aoulouz. The Plains of Rohan are directly beneath it. There is a mountain located just southeast of the modern town of Taourirt that could be the Lonely Mountain from "The Hobbit", but this is only a guess. Laketown may once have stood on the lake named Barrage Hassan II, but rivers can change course and depth over time and lakes can change in shape. 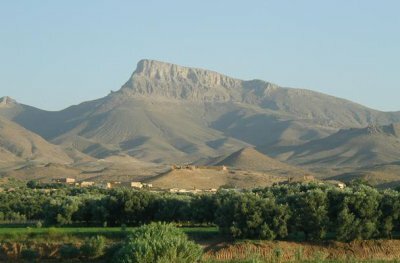 The Iron Hills could have been located anywhere from the eastern Moroccan city of Jerada to the mountains further east across the border in Algeria. Chott Chergui, a large salt lake in northwestern Algeria, is a good guess for the Sea of Rhun. These locations from "The Hobbit" are more guesswork than anything else. This puts the Sea of Rhun much further, and more easterly, from Mordor than Tolkien shows on his map. Rhun may have been a huge area that bordered Mordor to the east. Last edited by MoroccoTheory on Wed Jun 25, 2014 8:51 am, edited 1 time in total. Could this be the Lonely Mountain? The secret door used by the dwarves would be high up on this side of the mountain. The same side of the mountain with different lighting. Could that be Ravenhill on the extreme left of the photo? Another view of the mountain from the slopes of Ravenhill. A view of Ravenhill from the mountain. Yet another view of the mountain. The whole area around this mountain is dotted with natural springs which would help explain a stream flowing from the front gate in pre-Phoenician times. One of the springs flows from this cave. Does anyone have any thoughts regarding this theory? "As for the shape of the world of the Third Age, I am afraid that was devised 'dramatically' rather than geologically, or paleontologically." "The action of the story takes place in the North-west of 'Middle-earth', equivalent in latitude to the coastlands of Europe and the north shores of the Mediterranean. ... If Hobbiton and Rivendell are taken (as intended) to be at about the latitude of Oxford, then Minas Tirith, 600 miles south, is at about the latitude of Florence. The Mouths of Anduin and the ancient city of Pelargir are at about the latitude of ancient Troy." "'The Shire' is based on rural England and not any other country in the world..."
Nodded to both in Appendices and Silmarillion (with supporting information within the HoME series) there are constellations and stars that correspond to the astronomy seen in the northern hemisphere of Earth, including references to the Sun, the Moon, Orion (and his belt), Ursa Major and other planets (described as "stars"; thus Carnil is "Mars"). As far as I can remember only Dwarf maps use shifted compass. Morocco would be somewhere near Harad or Umbar. This is another view of the mountain now named Narguechoum (my guess for the Lonely Mountain). The photo was taken near the entrance of Taourirt city, in northeastern Morocco. Could we be looking at the Lonely Mountain on the far right hand side of the photo? I agree that Tolkien never mentions Morocco or the Atlas Mountains, but I can't find another location on the planet that more nearly resembles Middle Earth. Nothing that in that photo you posted looks anything remotely like the Lonely Mountain or the locales near thereto. Nothing at all. I'm saying that the geography of the Atlas Mountains resembles the geography of Tolkien's Middle Earth. The mountain called Narguechoum shown on the far right of the photo may not closely match Tolkien's artwork. You also have to consider more than 3000 years have passed since Pre-Phoenician times and the shape of the land and mountains has changed. darthgandalf99 wrote: Sorry, but I have no idea what you're talking about. but it does. you just have to look at it with your left eye closed while squinting with your right, upside down and riding a rollercoaster at night underwater. MorrocoTheory, it sounds as if you have gone beyond the simple and enjoyable exercise of looking to find analogs to Middle Earth in the world around us, and that you've moved on to trying to make an argument that a specific location really "IS" Middle Earth? Morocco, Spain and the Balearic Islands look similar to Middle Earth/Beleriand. The Balearic Islands look like the remnant islands of Beleriand. The Atlas Mountains of Morocco are similar to the Misty Mountains. Last edited by MoroccoTheory on Tue Jan 27, 2015 9:47 am, edited 1 time in total.